The True family welcomes you to the ranch that has been their home for 50 years-- White Stallion Ranch. 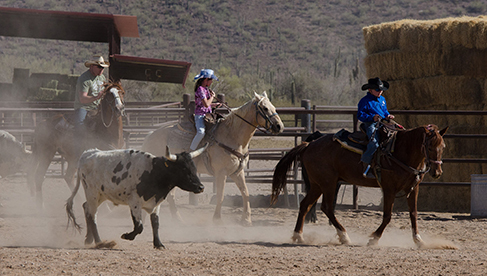 This Arizona dude ranch, which has been awarded the Official Best Dude Ranch in Arizona, invites travelers to reconnect with nature, family, friends and serenity. 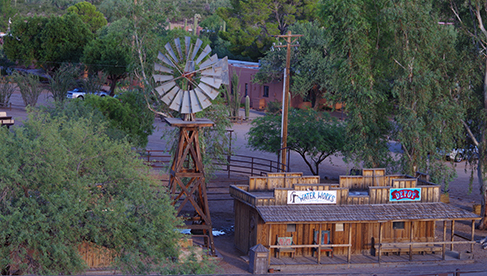 The trails are varied, taking guests through pristine desert and rugged mountains, whose vistas have enticed Hollywood filmmakers to use the ranch as a backdrop for television series and feature films for over 70 years. 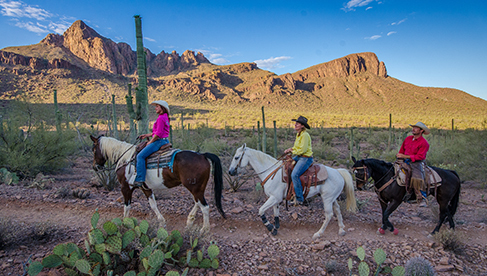 With one of the largest privately owned herds in Arizona, White Stallion Ranch has the right horse for every guest – from first-time trailblazers to life-long riders. 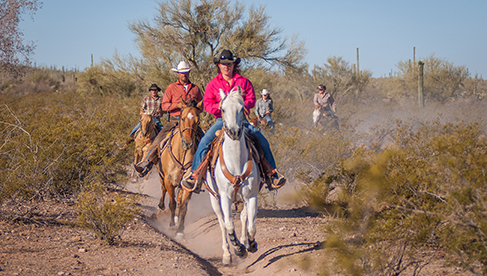 This ranch’s riding program has been carefully developed based on years of experience; you may choose from a relaxing walk through the desert to a challenging mountain ride or all day ride - and many rides in between. For guests who are less enthusiastic about riding, resort amenities include both indoor and outdoor options for exercise and entertainment. Comfort here is never appreciated more than after an active day. A glass of wine on the patio, a relaxing soak in the hot tub, a hearty home-style dinner and a good night’s sleep on a premium pillow-top bed make your day complete. White Stallion Ranch believes your vacation time is precious, so you’ll notice every member of the staff working hard to make it special. 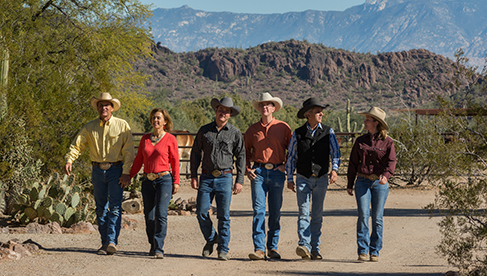 You’ll find yourself in the company of like-minded friendly guests, where lively conversations and friendships abound at this Arizona dude ranch. White Stallion Ranch is a proud member of the TripAdvisor Hall of Fame as the #1 property in Tucson for 5 consecutive years. 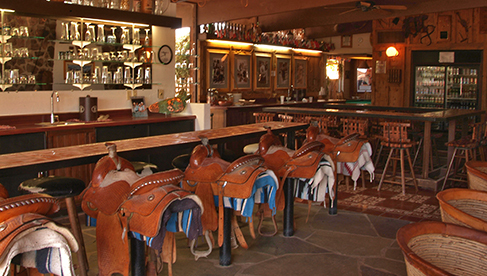 The ranch is located just 30 minutes from the history, art and architecture of the city of Tucson, as well as many top ranking tour quality golf courses and uniquely southwestern shopping opportunities. Rental cars are available at the ranch and airport transfers are available from Tucson International Airport. We believe that good horses, good people, good food and good friends are the ingredients for a great vacation. Our Dutch Oven Cooking workshop leaves plenty of time to relax and enjoy the amenities of the ranch. Horseback riding, though not included in this workshop, may be purchased a la carte. The ranch offers a heated pool, Redwood hot tub, fitness center, movie theater, recreation room, evening entertainment and guided hikes. 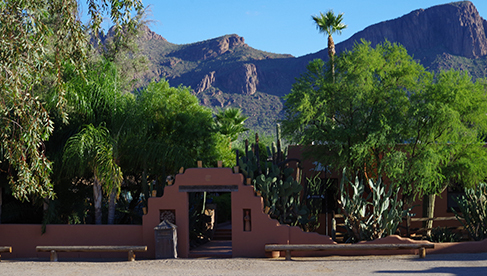 Your tuition includes; a Margarita welcome party, 4 nights lodging, all meals, ranch activities, airport transfers from Tucson International Airport, and 3 days of cooking classes. including tax and service charge. Workshop is Limited to 12 guests to provide each student plenty of time with the Chef. 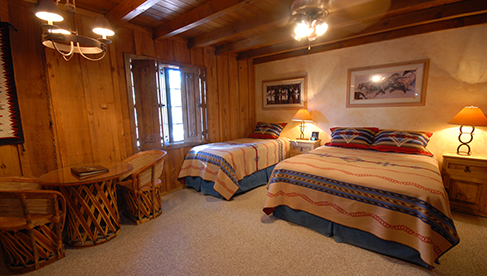 To book your vacation, contact White Stallion Ranch or call 520.297.0252 and in the USA 888.977.2624. Just $1,483 for your Family of 4 for 3 Nights. 5 Night Package $2,225 for your Family of 4. Enjoy Summer Family Savings of 20%. Special Includes: family lodging, all meals, horseback riding, evening entertainment and one free riding lesson per child. Your family will ride, swim, enjoy our lighted sport courts, tennis courts, movie theatre and game room; learn about horses, critters, and desert rocks. Ask about our weekly schedule for Stargazing, Art Classes and Ranch Rodeo! It’s not just a vacation, it’s an education…but don’t tell the kids! *3-night minimum required. Package is based on limited availability, may not be combined with any other offers or specials and may be discontinued without notice. Additional per-person rates apply for families of five or more. Not applicable to groups. Rates are subject to AZ state sales tax and 15% gratuity. How about a little present to yourself? It’s not too soon to start planning for December. With these great rates, space will go quickly. 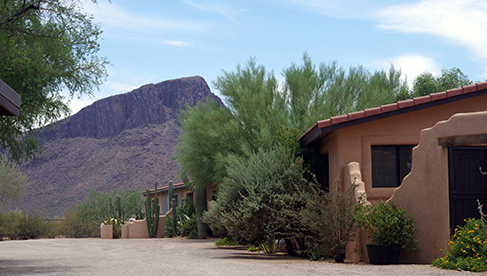 Rates include lodging, all meals, horseback riding (except Sunday), airport transfers from the Tucson International Airport, and use of the ranch facilities. 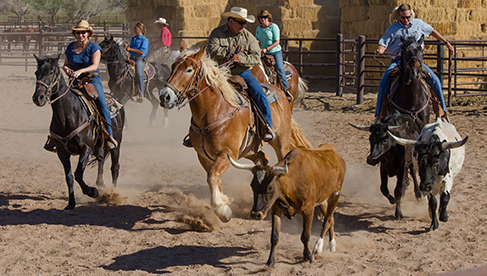 Depending on your choice of dates, a few of the highlights will be a steak cookout, breakfast ride, all-day ride in the Saguaro National Monument, our signature Indian Oven dinner, guided nature hike, a rodeo exhibition, and a variety of evening programs. Escape to a stress free, save haven for a few days. No worry about what to do, where to eat, or what to wear. It’s blue jean country, and the attire is casual. 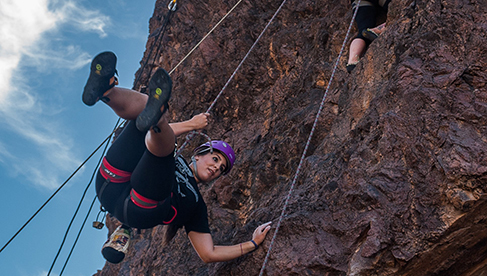 Enjoy horseback riding, hiking and rock climbing, delicious food, and delightful camaraderie. It’s the perfect fix to gear up for the hustle and bustle of the holiday season. This special is as golden as the desert in bloom. Bask in the warm early summer sun and enjoy the multitude of desert blossoms on the palo verde trees, ironwood trees, saguaro, and cholla cacti. It’s a Kodak moment every where you turn. Delight yourself with the frolics of our new-born longhorn calves. 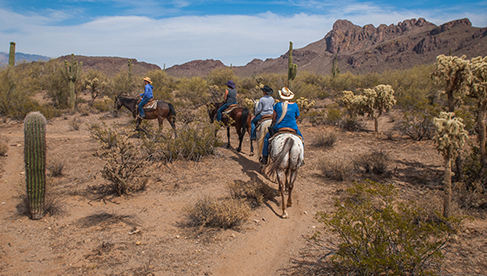 Our packages include lodging, all meals, horseback riding (except Sundays), cookouts, airport transfers from the Tucson International Airport, and daily ranch activities. 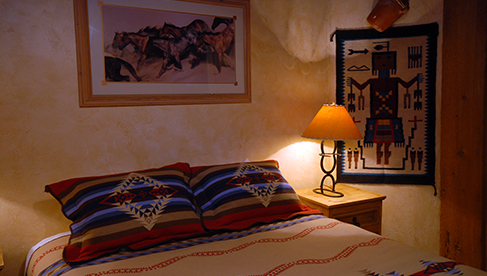 Three hearty, home-cooked meals are included in the daily rates. Many of our dishes are family recipes and all are comfort food, complimented by home baked desserts. Horseback Riding, Lessons, Hiking, Rock Climbing with instructor and all gear provided, Swimming, Tennis, Movie Theatre, Sport Court, Petting Zoo, Game Room and Evening Entertainment (line dancing, star gazing, art classes. desert critter presentation, local naturalists, authors. western entertainers, singers and campfires) All activities are included in daily rates except riding lessons and rock climbing. White Stallion offers riders that pass the lope test the chance to participate in fast rides at the ranch. 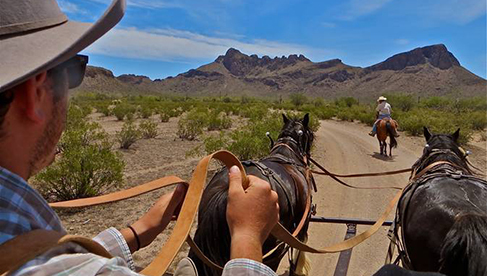 Wine and cheese rides, beer and Cheetos rides and all day rides into the Saguaro National Park to view rugged canyons, sandy washes and Native American petroglyphs are just some of the more popular adventures. Team Penning is available three times a week and a Half day ride and all day ride once a week. 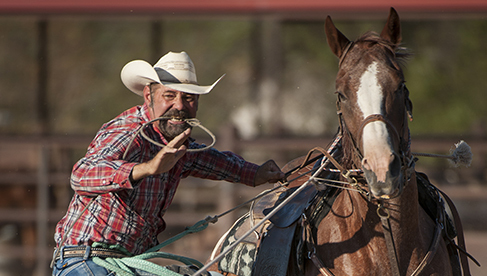 Ranch Rodeo on Wednesdays – Exhibition Rodeo performed by the True Family members and friends narrated with an eye toward the history of every event. 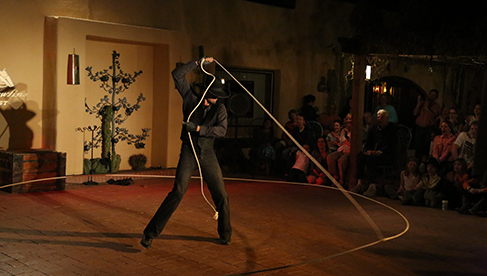 Evening Entertainment includes: line dancing, art class, critter night, star gazing, western singer/entertainer by the campfire, published authors, western trick roping, gun stunts and whip cracking show, and a variety of local naturalists. At White Stallion Ranch, the personal touch and hospitality of a traditional dude ranch is carefully blended with the service and amenities of a fine resort. The True family welcomes you to the ranch that has been their home for 50 years.